We have provided all phases of HVAC service within yachts for quite some time. Most of the units on these vessels are water-cooled systems. All of the units are made with Nickel type coils as are the condensers because of the salt-water intake and being at sea. The biggest issues usually involve strainers, which get blocked. Also, some boats aren’t equipped with piping that has dual strainers and compressors subsequently fail. You have to be careful when washing these coils to not use a high acidic type cleaner. Everything must be completely biodegradable and for the most part, the phase protection must be in place so the generator does not exceed operating amperages. 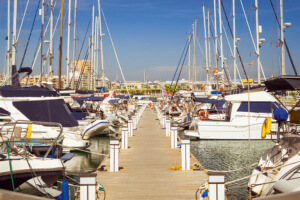 Keep in mind as a General rule of thumb; if you did 8 months on the water you should have it all checked out by a reputable HVAC company that specializes in these services for boats.